When I first heard this album upon release, I was dissapointed. I was expecting Soungarden of the 90’s. However, I had the wrong expectations. 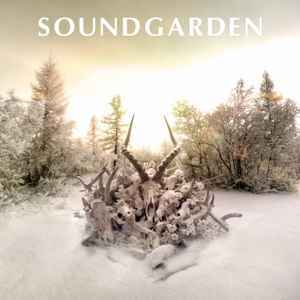 The album represents what Soundgarden would of sounded like if they never broke up and this was thier 4th or 5th record since Down on the Upside. From that point of view, this album is fantastic. To be honest, a 90’s sounding album would have sucked as the musicians have evolved. The sound would have felt forced and unatural. I have a US copy, booklet has no print errors. Great album, I think it sounds better/different on vinyl, maybe a different mix, as more sounds seems to come through. Can't believe so many copies of this great album are going so cheap. This is a great pressing and sounds much better than digital. There is a print finishing error with the booklet supplied with my copy of this pressing. The second 4-page section has been inserted twice, so the lyrics for the songs "By Crooked Steps", "A Thousand Days Before", "Worse Dreams" - all appear twice. No lyrics for "Non-State Actor", "Eyelid's Mouth", "Rowing". I have requested a return with the vendor, will post an update in due course. "No one knows what intelligent life is." Ohh..thank God. In my room i m listening the masters brilliant rockers again. My room became a soundgarden. THANKS GUYS! I tried Cornell's personal albums, i tried again with Audioslave....nothing like the 4 Soundguys! I m sure 1000% that these guys (as SOUNDGARDEN)) are incredible, this music blend is unique. I can say that "Blood on the valley floor" song is a very limited "human's mind/soul" creation. One of the best rock musicians in the world , Kim Thayil, wrote it. It would be so easy for a band, fifteen years between albums, to lose all their purpose, cohesion and meaning. Soundgarden have managed to retain all three, and have delivered a wealth of terrific material. Concise, heavy riffing and time signature playfulness return here, and their pre-grunge quasi-psychedelia makes welcome cameos throughout this ambitious album. C. Cornell's vocal delivery seems more grounded than ever, all while soaring towards pitch altitudes last visited during Bush Snr's administration. K. Thayil's pull-off and hammer-on riffing has an all new context, and the catchy, condensed licks are real features of the album (again, recalling BadMotorFinger's greater moments). While we've heard heavier phrases from the band, there is a synergy here that was never captured on previous releases (and eras). The band are certainly in-step with one another, and it is very easy to take M. Cameron's exquisite and technically astounding drumming for granted. This alone is a new level of greatness for the band. B. Shepherd again, occupies the regions between rhythmic and melodic purpose; visiting the lower registers of his instrument more than I've ever noticed. (Though the trademark tenor-range riffing and runs return where required). Consistency is where the band lives - we see a real follow-through from the opening to the closing, and we never feel that we're experimenting along with the band (as Superunknown tended to do) - we feel like they have given us the best they have, in the best manner they can give it. And who can ask for anything more?